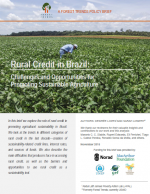 In this brief we explore the role of rural credit in promoting agricultural sustainability in Brazil. We look at the trends in different categories of rural credit in the last decadecreation of sustainability-related credit lines, interest rates, and sources of funds. We also describe the main difficulties that producers face in accessing rural credit, as well as the barriers and opportunities to use rural credit as a sustainability tool.